It's been great to read Wayan's thoughts on the XO Tablet and see the photos and videos of his daughters taking the tablet through the toddler-approval process. However when I read "The XO Tablet Just Killed the XO Laptop", I couldn't help but start up a text editor to write this piece. Why? Because I think the XO Tablet has some significant limitations when used in schools and developing countries. Now, based on Wayan's comments I think it's clear that the XO Tablet comes with a lot of good content. In its current form that means good content for North American toddlers and children (and their paying parents). And as a recent press release indicates the 8,000 XO Tablets going to Uruguay will come preloaded with local content. It's good to see that such mass-customizations for the requirements of large orders are possible. What about teachers who want to make an app available to all the students in their class or school? What about XO Tablet owners who don't have a credit card to purchase apps? What about environments without Internet access? "At this time, you should include your app in Google Play for Education only if it is targeting the US K-12 market." Oh, and yes, mobile carrier billing and Gift Cards also do exist for Google Play however only for about a dozen countries. As for the last issue: Even in the future I simply can't imagine a Google Play store which works without Internet connectivity. Android's very existence is based on the premise of getting more users online and connected to one of Google's many services. So I see zero incentives for Google to make an offline store available. The reality today - and for the foreseeable future - is that the Android ecosystem (which the XO Tablet is built on) is designed with individual users with an Internet connection and credit card in mind. And guess what, that's quite far away from the reality of schools and developing countries today - and for the foreseeable future. It's going to be very interesting to see how Uruguay addresses these issues in the aforementioned upcoming evaluation with 5- and 6-year-olds (which means pre-school and grade 1 pupils respectively). In the meantime I think it's important to emphasize that the XO Tablet and the XO laptops were designed with very different environments, users, uses, and goals in mind. So at this point I personally would be very cautious to recommend the XO Tablet over the XO laptops to anyone planning to use them in schools or in developing countries. Resumen en español: Ha sido genial para leer los pensamientos de Wayan sobre la XO Tablet y ver las fotos y los videos de sus hijas usandola. Sin embargo, cuando leí el articulo del jueves llamado "La XO Tablet acaba de matar a la XO Laptop" no podía dejar de poner en marcha un editor de texto para escribir este artículo. ¿Por qué? Porque creo que la XO Tablet tiene algunas limitaciones importantes cuando se utiliza en las escuelas y en los países en desarrollo. La realidad hoy en día - y en el futuro inmediato - es que el ecosistema de Android (que la XO Tablet está basado) está diseñado con los usuarios individuales con una conexión a Internet y tarjeta de crédito en cuenta. Y adivinen qué, eso es bastante lejos de la realidad de las escuelas y de los países en desarrollo en la actualidad - y en el futuro previsible. Mientras tanto, yo creo que es importante destacar que la XO Tablet y la XO laptop fueron diseñados con ambientes, los usuarios, los usos y las metas muy diferentes en mente. Así que en este momento yo personalmente sería muy cauteloso al recomendar la XO Tablet en vez de las XO laptops a cualquiera que esté planeando usarlas en escuelas o en países en desarrollo. 1. What about teachers who want to make an app available to all the students in their class or school? The XO Tablet comes with 160+ apps already, so teachers will have much to choose from right out of the box and can direct the whole class to that app on day 1. Compare this to the XO Laptop's software choices. How many apps does it ship with? How easy is it for a teacher (vs. software engineer) to add new apps to Sugar? And how many apps does she have to choose from? Are there even 160 software programs available for Sugar in total? And although a teacher is not very likely to write an activity, students are and actually do! With the XO Tablet a teacher says, "WOW! That's more apps that I ever imagined. Students, open X app now." vs. the XO Laptop where she says "Wait, where is the software or content? I have to go where? Download what? What is this 'command line' that you speak of?" this like a mute/deaf/blind discussion. You ask if sugar has 160 apps. I say "over 300" and your counter argument is "are not preloaded so do not exist". I really do not see any reason addressing this only to get another unrelated response. Regardless of all these, there is one thing that is important about the XOtablet, to what extend can you (as an individual or deployment) customize them. What is license of the software. Can you have your own National/State/District/School appstore to include additional/modified content? These is very important if we are talking a global education platform. And this is where we differ. I don't see, haven't seen, and would be surprised to see a small deployment doing any level of customization. Yes, some schools may want to add an app or two to all tablets, some teachers may want to add an app for their classroom, but the reality is that for small deployments, this usually doesn't happen. They use whatever software or content that comes pre-installed on the device and judge its efficacy based on those installed items. Please show me a National/State/District/School appstore for any software ecosystem or platform. The only ones I know of are for large deployments where there is existing infrastructure and investment on the scale required to make those investments worth while. And if its a large deployment, I will agree with you - licenses matter then. You do have a point about the importance of pre-installed content. That's why I said that it's great to see the customizations being announced for Uruguay. However small projects certainly do also have customization requests on even the most basic of aspects such as the language. Well, tough luck, right now the XO Tablet is only available in English and Spanish. And even if the Dreams interface is translated to another language I don't think that the content providers behind the apps or OLPC itself will start translating them to other languages. And good luck finding educational Android apps in German, let alone Aymara, Amharic or Urdu. So with the 160+ apps the XO Tablet is definitely not starting from 0, but only as long as you happen to speak English or Spanish. Many of the Sugar activities on the other hand (and associated documentation, teaching materials, etc.) *is* available in many more languages. So in my mind this is definitely a plus point for the XO laptops vs. the XO Tablet for schools and developing countries. Hence my point that XO Tablets are mainly for the Americas. That said, about half of African countries teach in English (or want to) and English makes India happy, so there are a few billion who are happy with English/Spanish. Not all apps cost money, and again, at least donors, teachers, parents, and students have the option to add apps from a cornucopia of options. With the XO Laptop, a teacher would have to write an app for Sugar just to use it - and that ain't gonna happen, credit card or not. A short list of free, no-add, no-tracking android educational activities would be nice indication of "cornucopia". Regarding buying, are we discussing for that school in "OutOfHere" that the teacher hardly finished grade 5 or "Market Heights elementary"? Regarding buying, the reality is that small deployments are usually funded by a benefactor who has access to a credit card (that's how they bought the XO to begin with) and will buy as many apps as needed to support education. Regarding the educational attainment of a teacher, I think the one you are describing in "OutOfHere" would have trouble with any technology intervention - XO Laptop or Tablet. Okay, point taken about the free apps. Funny enough, until I saw this post in draft, I didn't realize that I'd not connected my daughter's XO tablets to the Internet. I connected one, just to make sure the XO Tablet could be easily set up to do so (via the adult/Android interface) but I still haven't connected the other - and both girls have yet to use any Internet-requiring apps. So yes, Internet access is nice to have, and a requirement for downloading Play Store apps (or any web content for that matter), but its not a requirement to use the XO Tablet any more than the XO Laptop. In fact, compared to the XO Laptop, there is even less need for the Internet with the XO Tablet because the latter comes with so much more content. Now add in the ability to buy as few or as many as you want, at any time, with accidental damage coverage, and I stand by my original recommendation: XO Tablet over the XO Laptop for the vast majority of small deployments in any home, school, or country. I'm with you here. Android is a much better OS than Fedora/GNOME for tablets *and* the XOs. Regarding Sugar, will hopefully be ported or rather transplanted to android without all the useless "ballast" so it can fly. An effort to go html5 is on its way, though I would rather see it going native. mavrothal, please note the current efforts are focused on making HTML5 Activities run within Sugar, not on making Sugar become an HTML5 app or run on Android. "The graphics system gets in the way -- you can't run X on top of Android, yet Gtk depends on X, and Sugar depends on Gtk." If you think of it, Sugar pioneered what is today a common place UI for tablets/smartphones, and was the first (?) to have some kind of sandboxing at the core of the system. However, (I think because of software politics or just academic overconfidence), implemented these in a very "unfortunate" way (to the point that will hardly run on another distro without major hacks). So today the infrastructure in Android allows you to do everything that Sugar does. UI, sandboxin, collaboration even some rudimentary journal. Is just not Gtk/Python (and would be a colossal mistake to try put yet another layer and try to keep those). "The real problems in the "Sugar in Android" scenario I see are a) convince existing contributors to change their ways and b) get FOSS developers enthusiastic about the job when you take away the fun of "hacking an alpha software". I do not think that (a) is necessary. x86-Sugar could remain a Fedora/Gnome/Python stack and have only the design team common with the "ARM-Sugar". This may actually be preferable for a clean re-implementation and the XO-tablet team (assuming there is one) may serve as an "ARM-Sugar core". It is also useful to keep the Fedora/Gnome/Python-Sugar for when Fedora/Gnome/Python become more "fun to use" on ARM devices. (b) may be more tricky but should be feasible judging from the number of free iOS/Android apps out there"
Those are all nice ideas and I agree with most of what you're saying. However I currently don't see Sugar Labs or OLPC having the necessary leadership or resources to do that (and do things right that is!). As I said in another comment earlier: That "deep selection of polished software applications already preloaded and millions more available for download vs. a handful of bespoke apps" might be available for English and Spanish but becomes pretty thin once you venture outside of those languages. And yes, Android certainly is a great operating system. However Sugar and the entire ecosystem (Activities, documentation, etc.) has come a long way since 2007. That, in my mind, provides more educational value to schools and developing nations than simply having an Android device. And even if someone were thrilled by Android: Why choose the XO Tablet over one of the many alternatives (from cheaper Shenzhen tablets to similarly priced Acer and Asus models)? The XO Tablet beats other tablets in its array of preloaded apps and content. Unless you have the time and skill (and dedication to support it over time), building your own educational Android image and flashing 100 tablets or less will cost you more that just buying the XO Tablet. I would also like to mention that having children use Google Play violates Google's terms of service and can result in a ban on the account. "Age Restrictions. In order to use Google Play you must be 13 years of age or older. If you are between 13 and 18 years of age, you must have your parent or legal guardian’s permission to use Google Play. You must not access Google Play or accept these Terms if you are a person who is either barred or otherwise legally prohibited from receiving or using the Service or any Products under the laws of the country in which you are resident or from which you access or use Google Play." Jon, thanks a lot for the heads-up. This is a very important point which I had totally missed! Does the author not understand that just because as device has access to Google Play it is not limited in any way from using other sources for APK downloads? The user and or the user's tech support just has to uncheck the setting to disallow content from other sources. It seems the author's real gripe is that a teacher might not know HOW to write an app for Android. Which is really no different than saying some teachers might not know how to write an app for the linux of the olpc notebook. The story looks to be making issue where there really is none. Ned, I'm well aware of the opportunity of side-loading APKs (that's how I got Google Music before it was available here in Austria;-). However it's not a particularly convenient way to install (and update) apps, much less so on a large scale. So in my mind that is a significant blocker for its use in schools and developing nations. And I'm not sure where you're getting the idea from that my "real gripe is that a teacher might not know HOW to write an app for Android"? Having a software engineering background and spending some time in schools and with teachers I never had the illusion that teachers would start developing their own software on a large scale. And those few who are have the time, energy, skills, and motivation will do whatever is necessary, pretty much regardless of whether you ask them to write Sugar Activities in Python or Android apps in Java. Side-loading APKs - that sounds like the original Sugar Activity install process: go to command line, bash this, sudo that. No, it's not nearly as bad. You simply uncheck an option (as Ned mentioned) and then you can install apps by manually downloading (or copying them over from a computer) and then clicking on them once to start the install process. But still, that's a long shot from having a convenient way to install and manage apps on dozens or hundreds of devices. I spent most of Saturday "evaluating" software on the XO Tablet for appropriateness and educational value. I still have a lot of apps to try before I do an in depth review. However I can already say this: while some of the content is excellent, some is pretty worthless. I am also trying to see how the tablets would be used in a real classroom situation. So far, it gets a big "F" for fail! For enrichment for individual students, a few of the apps are excellent. I suppose it could be used to replace the hated "busy work" that less creative teachers sometimes use to keep their students occupied and out of their hair. But, to be able to use it for an entire class, well, I haven't seen anything that approaches the utility of the new touch screen XO-4. However, for home use for very young children, or preschool use (as Uruguay proposes to do) the XO Tablet is an excellent choice. One thing I can tell you right now is that the Camera on the XO Tablet is awesome! I think even a preschooler can take nice photos with it and the Camera app offers a lot of easy to use creative variations that can be applied. Even adults could have a lot of fun with the camera feature. I'll be back in a day or two with some evaluations of the software on the XO Tablet. Although I welcome the move to a touch device/tablet, and that I'm happy to see that OLPC has chosen a lighter operating system (I hope Mozilla gets a chance to support the tablet with Firefox OS soon), I just can't get how having the Android apps would be good for children, in the long run, at least outside of the US. Do these allow advertisement? Is there some special rule to prevent them in the educational section? Wayan, did you have a chance check for ads on your daughters' tablets? Are there any? Maybe the educational apps on the Play Store have a special rule for that? Then again, I think the OLPC project hasn't seen enough true leadership in the last few years, so to me, it was kind of digging its own grave for a while now. I've seen some supporters of the project fallback on Classmates as "better systems" and only sticking to Sugar, and other do the contrary. "The concept is good but those preloaded free applications and free books may not be what you expected. Many of the applications has ads and have social network elements in them (which I think not acceptable), that may not suitable for children." Wayan, would be great if you could let us know if that's really the case. And what else is new? The Internet is full of ads as well, even with Adbock, but I don't hear calls to say kids shouldn't be there - quite the contrary usually. Now don't get me wrong. I dislike ads and wish there were none, but I can understand why they are there and I don't see them as a show-stopper. Personally I'm not a fan of exposing children, especially in schools, to ads. What would you think if your daugthers' (pre-)school books were suddenly filled with ads? I don't like ads Christoph, see above. But there are ads on TV, there are ads in magazines, and there are ads in free software. I am not surprised by this even though I do try to limit my daughters exposure to all of the above because of the ads. And yes, that means, I encourage them to use the apps without ads - and there are many. And isn't this the same group that argued many times before that its better to have something than nothing, if nothing is the other option. Yes, but we're talking about ads in education materials and tools provided via schools by NGOs and/or governments. At least to me that's quite different than having ads on TV, in magazines, on billboards or having a knowledgable parent specifically decide what apps his kids should use. Small deployments, Christoph, I'm talking small deployments which are ones funded by individuals with 50 to 100 laptops max. If its a national gov, I am sure they would get their own software mix without ads. Well, we'll see about that in Uruguay. And just for the record: I'm not a fan of even a single child receiving an educational device which has ads tied into it. Should your daughters have to put up with ads in their textbooks just because they happen to go into a small school which can't negotiate special deals with publishers? Then you better not be a parent in the modern age. Ads are everywhere. One could make the case that Disney movies are one big ad. So far, I've found 1 ad-supported app on the XO - and none in the books. And since the XO Tablet doesn't come with textbooks, your example is moot. Finally, my daughters *are* using the XO Tablet and I would be okay with them using it in school. That's why we have teachers, to help children navigate the real world. I don't know who wrote that amazon comment but it sounds like an advert for Amazon kindle, possibly by the head of marketing in the amazon bookreaders and not an objective appraisal, I mean there is possibly a case for arguing that the OLPC XO tablet is not the best Android tablet on the market, but it is not trying to be, and especially if the critique is writen by someone who works for Intel! having those tablets planned for the US market, if great technically, is just travesting the [OLPC's] project's idea and disappointing many of its supporters... unless this is part of a greater strategy to have the tablets reach the 3rd world for a 3rd of the price or so. I fully see how a generic Android tablet with mainstream apps disappoints the technology supporters, especially those enamored by Sugar. 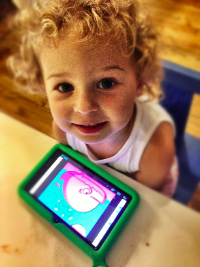 OLPC isn't innovating with 90% of the XO Tablet idea. And again I say that's a good thing. The teachers, the ones who have to make tech work in the classroom with 30-60 impatient children - all I hear from them is a desire for a device that just works. Something they can pass out to kids, who then can quickly start up and do and activity that is relevant to their lesson. With the XO Laptop, there were all kinds of issues (keypad, slow startup, buggy software, limited activities, etc), with the XO Tablet, any issues they have will be standard issues (how to fit it into a lesson, keep kids on task, etc) that any ICT deployment faces. For OLPC, going from unique + common issues to just common issues is a great leap forward in ease of use. But you're right. No fun for hackers. No excitement for software developers. No room for constructionist-first educational change. Just a tablet that works. Oh yeah, and at a lower price point than any XO Laptop. "I am also trying to see how the tablets would be used in a real classroom situation. So far, it gets a big "F" for fail! For enrichment for individual students, a few of the apps are excellent. I suppose it could be used to replace the hated "busy work" that less creative teachers sometimes use to keep their students occupied and out of their hair. But, to be able to use it for an entire class, well, I haven't seen anything that approaches the utility of the new touch screen XO-4." So I guess we'll just have to wait and hear from more teachers and teachers in developing countries what they think about the XO Tablet. Yannik, I think you hit the nail on the head when you say: "Then again, I think the OLPC project hasn't seen enough true leadership in the last few years, so to me, it was kind of digging its own grave for a while now."